Wiki Loves Monuments has received a Special Mention of the Jury at the European Union Prize for Cultural Heritage/Europa Nostra Awards. 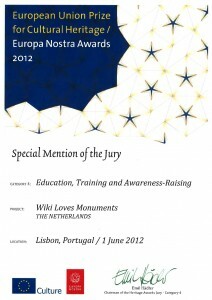 As some may know, after the 2011 contest, we have nominated Wiki Loves Monuments for the European Union Prize for Cultural Heritage / Europa Nostra Awards. These prizes, jointly presented by the European Commission and Europa Nostra, give some special attention to cultural heritage related projects in Europe which have been particularly successful – in different categories. One of the categories, “Education, Training and Awareness-Raising”, we felt to be appliccable for Wiki Loves Monuments. And not without success! While we haven’t won the Prize, we did get a Special Mention of the Jury – a clear statement of recognition by the experts in the field of Cultural Heritage that is much appreciated by us. Besides this honor, Europa Nostra is also an international partner for Wiki Loves Monuments and helps us getting in touch with the local heritage organizations. More information about the prize and its winners in all categories (definitely worth a look) you can find on the website of Europa Nostra.